He’s back. Even older. Even funnier. It all begins with a hot air balloon trip and three bottles of champagne. Allan and Julius are ready for some spectacular views, but they’re not expecting to land in the sea and be rescued by a North Korean ship, and they could never have imagined that the captain of the ship would be harboring a suitcase full of contraband uranium, on a nuclear weapons mission for Kim Jong-un. Yikes! Soon Allan and Julius are at the center of a complex diplomatic crisis involving world figures from the Swedish foreign minister to Angela Merkel and President Trump. Needless to say, things are about to get very, very complicated. 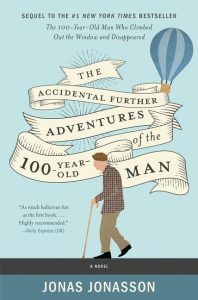 Another hilarious, witty, and entertaining novel from bestselling author Jonas Jonasson that will have readers howling out-loud at the escapades and misfortunes of its beloved hundred-year-old hero Allan Karlsson and his irresistible sidekick Julius. Ten years ago Jonas Jonasson published The Hundred-Year-Old Man Who Climbed Out of the Window and Disappeared. It was his first novel and it sold ten million copies. It's one of those books that keeps showing up different places because it keeps finding new fans. And those fans weren't finished with Allan Karlsson. A couple of years ago, that book was recommended to me and I meant to read it. But you know how that goes. But at least when the sequel was pitched to me by the ladies at TLC Book Tours, I didn't hesitate. Of course, I meant to read the first book first. But I didn't. 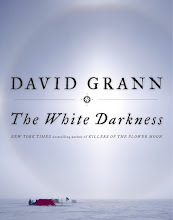 And while it might have helped some, it absolutely is not necessary to have read the first book before reading this one. But this one will probably convince you to read the first one anyway, so maybe just read them in order. Despite the humor of the book, Jonasson has a lot to say about politics and the political environment in which we currently find ourselves. Which brings me to a warning: Jonasson takes aim at a lot of political leaders in this book. But mostly as Kim Jong-un and Donald Trump. So if you're a fan of either of those men, you might not care much for this book. On the other hand, if you're not, you're going to enjoy this book that much more. If it were up to me to give you a summary of this book, I'd pretty much leave it off before that second sentence even finished. Because this is a book that keeps surprising you with the absurd situations that Allan and Julius find themselves in and you just need to let it be a surprise. If you read this book and tell me you see things coming before they happen, I will likely call you a liar. Jonasson takes readers to places you can't imagine Allan and Julius will find themselves as the uranium situation develops. My only little quibble with the book is that it landed a bit too softly for my tastes, although I'm not giving anything away when I tell you that you know all along that things will end well for these two old men. I wonder how much longer Allan Karlsson can live. I feel like he just might have another book in him. Thanks to the ladies at TLC Book Tours for including me on this tour. For other opinions of the book, check out the full tour. Jonas Jonasson is the author of the international bestseller The Hundred-Year-Old Man Who Climbed Out of the Window and Disappeared, now a major motion picture. Prior to his success as a novelist, Jonas was a journalist for the Swedish newspaper Expressen for many years, and later became a media consultant and founded a production company specializing in sporting events for Swedish television, which he sold before moving abroad to work on his first novel. 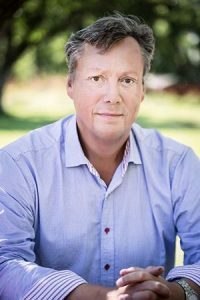 He is the author of the internationally successful novels The Girl Who Saved the King of Sweden and Hitman Anders and the Meaning of It All. He lives on the Swedish island of Gotland in the Baltic Sea. Find out more about Jonas at his website, and connect with him on Instagram, Facebook, and Twitter. New to me. Thanks for the review. Thank you for being on this tour! I read the first book, and my husband and I both loved the movie. I'm so glad to hear how much you liked this sequel. I had forgotten about the first book. These kinds of reads are enjoyable and easy but as of yet, I have not picked this one up. I have to be in the right mood. My reading has been so slow this year.